This is my 27th installment of Babywearing Stories 365. Each installment features a babywearer in 1 photograph and their answers to 5 questions. My goal is to normalize, promote and celebrate daily Babywearing, moving beyond *what* we use to carry our babies and shifting focus back on *why* and *where* we carry. I hope to share the stories of moms, dads, and babywearing caregivers all over the world. Enjoy! I’m Katie, a first time mom, and my son was born this past November. My husband took this photo while we were out on a walk together. Last year was a big one for us – we bought a house, spent two weeks working on removing wallpaper and painting it, and we moved in the first weekend in October. Just a month later, our son joined us! This wasn’t our first walk together, but it was the first time we used a wrap. The week before he was born, Hurricane Sandy came through our area and a lot of trees fell down. Our new house is on a quiet dead end street with a great pond at the end of it and trails all around it – the baby carriage couldn’t go far with the branches and trees on the ground (we tried), but baby wearing could! This is at a clearing that’s obviously a good fishing location, but I like it call it our thinking spot. There’s a large rock I’d sit on and watch the lake with my son during our walks. 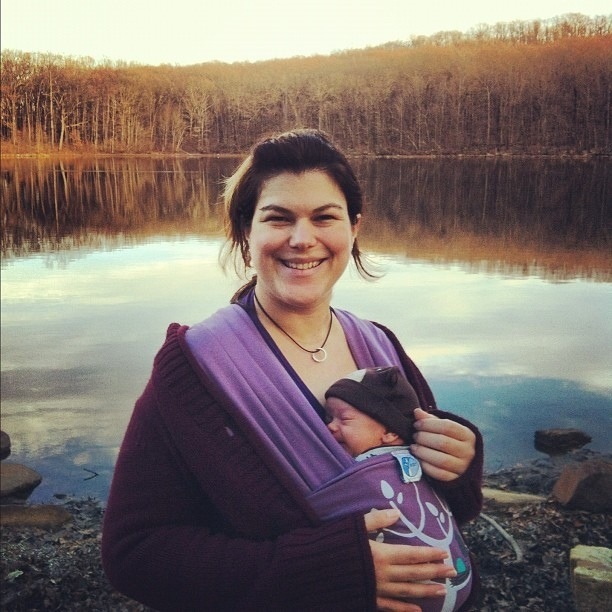 Our first wrap is a Moby that I got at my shower, and we really enjoyed using it for walks. We were able to go over or around trees and branches on the trail around our neighborhood pond. He usually falls asleep in it and misses all the scenery! November 23, 2012 – my son was 18 days old. Babywearing on our walks let us go over rough trails that stopped a stroller. We enjoy having him close to us (yes, my husband wears the baby too!) and getting some fresh air and exercise. Friends had sworn by the Moby so it was my first choice, but I’ve since learned about many more versions of baby carrying and now have an assortment of carriers, woven wraps, and ring slings. They come in handy at home as well as when we are out, and we don’t have any concerns about fitting a stroller in tight spaces. The ring sling has had the most use recently as it’s quick for frequent ups/downs and it helps to put him to sleep.